Most commonly, your wardrobes will always be stuffed with a wide range of kurtis; long kurtis, designer kurtis, Party wear kurtis and so on. 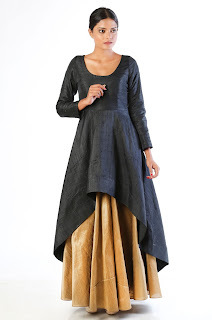 How about trying a new look with the kurtis that you have in an innovative way? Don’t think that kurtis will always make you look desi. With a small tweaking of the bottom piece and accessories; we can change the complete outlook and carry ourselves in different looks and styles. Do you always feel that it’s very tough to appear different every day with your desi-dressing style? The biggest hassle of all, for a woman is to present her in a trendy and stylish manner according to occasions. Don’t worry; getting bored with your usual dressing style is quite natural. Around the globe, it is widely accepted that girls show off their best in ethnic wear. Kurti is one among the versatile garment and suits ladies of all age groups. It’s not surprising that Kurti is never out of fashion. The trendy fashion of the 60s is now backing in trend and Palazzos are widely used by ladies of all age group because of the comfort it offers? Match your long kurtas or Indo western Kurti with a contrast color Palazzo and trust me, you get an all-new trendy look. Be careful when you select the prints and color of palazzo pants. Try your kurtis with long maxi skirts for that princess like look. Your designer kurti with a knee length or floor-grazing skirt will give that serious yet ethnic look for you. This style is suitable when you are attending a party. To appear cool and fashionable when you attend a mehndi function, pair your designer kurti with a dhoti of matching the color. This is going to spice up your looks and add a spark to your desi style especially if you are of thin stature. If you have a smart casual dress code at work, you can try your long or short kurtas with jeans. It gives you that funky look. 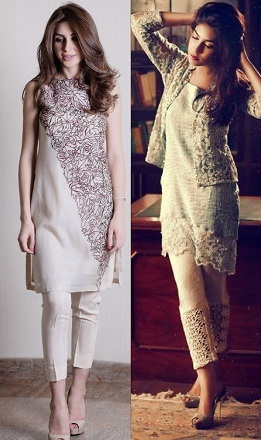 Both Plain and printed kurtas go well with jeans. You would know that Patiala type bottoms originated in Punjab. But now it’s used all over by ladies of all age group. Designer Kurtis with Patiala bottoms gives you an all new and different look. Another interesting fact about Patiala is that irrespective of our stature it makes us appear healthy. 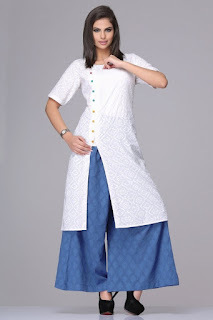 Kurti combined with ankle length pants is high on the hog now a day; because of the cool and classy look it gives. You will appear smarter with matching big earnings and other accessories. Leggings are widely available in all colors that too in wide variety materials. Match your long kurta with the right colored leggings, and you will feel all relaxed and cool the entire day. Leggings present both comfort and fashion. A couple of things to note when you select your legging material are; the material should be thick, not see through and should not be too tight and small. Pair your kurta along with straight pants to get an Indo-western look. Try big jhumkas along with this, and you can steal the show with your appearance. To get the maximum impact of fashion, when you are attending a party, wear your kurta with a jacket. The jacket can be a cropped jacket or long jacket matching the style of your kurti. Use matching earrings to appear stunning and trendy. 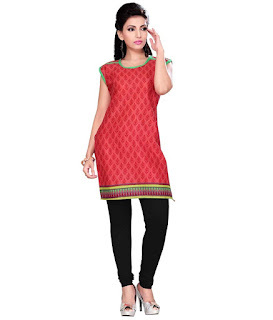 Kurti is a versatile garment, and the happy news is that all the girls look good in it. Apart from the comfort that these Kurtas provide, It can be styled and mixed and matched for different looks to match the occasion as explained above. Try this out and share your comments. To browse through a complete new world of Kurtis fashion click here.